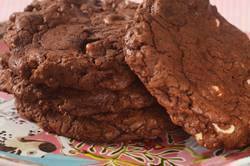 Chocolate Fudge Cookies, also called Chocolate Rads, are hard to describe as they seem to be a cross between a chocolate cookie and a chocolate torte. They are instantly recognizable by their shiny and cracked bumpy surface. When you break one open, you will find that the inside is wonderfully soft and fudgy with an intense chocolate flavor. The chocolate flavor comes from adding a whooping one pound (450 grams) of melted dark chocolate to the batter. The chocolate lover is in for a real treat with this cookie. This Chocolate Fudge Cookie batter is not like most cookie batters where we beat the butter and sugar until creamy, and then beat in the eggs and flour. Instead, the batter is made like a torte or sponge cake, that is, by first beating air into sugar and eggs. Once the mixture has become very thick and pale yellow in color, a melted mixture of semi sweet or bittersweet chocolate and butter is folded in. Next, mix in just a little cake flour (can use plain flour), that has been leavened with baking powder. The final step is to fold in white and dark chocolate chips, along with some chopped nuts (pecans, walnuts, hazelnuts or almonds). The batter does need to be chilled so it is firm enough to form into cookies. But this only takes about 30 to 60 minutes in the refrigerator. The important thing with these cookies is not to over bake them or they will be dry. They are done when they are set, yet the surfaces of the cookies are still shiny and cracked. You may want to bake one or two testers to get an accurate baking time. Chocolate Fudge Cookies are best the day they are made but they can be stored in an airtight container for a day or two. This recipe makes about 20 large cookies, but you can half the recipe. Lastly, chocolate is the dominant flavor in these cookies, so it is important to use a high quality, semi sweet or bittersweet chocolate that you enjoy eating out-of-hand. Buy the best you can afford. Look for chocolate that has a lovely shiny finish (a sign that the chocolate was cooked at the right temperature for the right amount of time) and one that has that wonderful 'snap' when you break it into pieces. Chocolate Fudge Cookies: Preheat oven to 350 degrees F (177 degrees C) and place rack in center of oven. Place the pecans on a baking sheet and bake for 8-10 minutes, or until lightly brown and fragrant. Let nuts cool and then chop coarsely. Sift or whisk together the flour, baking powder, salt, and espresso powder. Melt the chocolate and butter in a stainless steel bowl placed over a saucepan of simmering water, stirring until smooth. Remove from heat and set aside to cool to room temperature. In the bowl of your electric mixer (or with a hand mixer), beat the sugar and eggs until pale yellow and thick, about 5 minutes. (When you slowly raise the beaters the batter will fall back into the bowl in slow ribbons.) Beat in the melted chocolate mixture and vanilla extract. Fold in the dry ingredients to the chocolate batter and mix only until incorporated. Stir in the chocolate chips and nuts. Cover with plastic wrap and refrigerate the batter just until firm, about 30-60 minutes. Drop batter by 1/4 cupfuls (60 ml) onto prepared cookie sheets, spacing evenly. With moist fingers, press batter to form 3 - 3 1/2 inch (8-9 cm) rounds. Bake cookies for about 10 - 12 minutes or just until set. The tops of the cookies will be cracked and shiny. It is important not to over bake these cookies or they will be dry. Remove from oven and place baking pan on a wire rack to cool. When cookies are firm, remove from baking pan and let completely cool on rack. These cookies are best the day they are baked but can be stored in an airtight container at room temperature for a few days. Bon Appetit Editors. Bon Appetit Christmas Cookbook. Pantheon. New York: 1995.